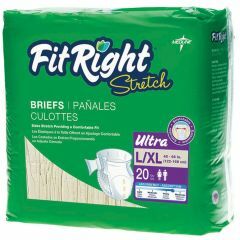 FitRight Stretch Ultra Brief promotes a discreet, comfortable, garment-like fit meant to enhance patient dignity, mobility and independence. Flexible stretch panels stretch for a secure and comfortable fit that enhances patient comfort and improves ease of use for staff. 4D-Core with odor protection wicks fluid away quickly to promote dryness and help maintain skin integrity. Soft anti-leak guards reduce leakage and improve containment. Active hip-protect side panels were designed to help protect skin from excess friction andpressure. Moisture alert wetness indicator changes color when garment has been soiled. Available in sizes MD/RG (32" - 54", 8-137 cm); LG/XLG (48" - 66", 121-167 cm); and XLG/XXL (60" - 70", 152-177 cm). AllegroMedical.com presents The FitRight Stretch Ultra Brief. FitRight Stretch Ultra Brief promotes a discreet, comfortable, garment-like fit meant to enhance patient dignity, mobility and independence. Flexible stretch panels stretch for a secure and comfortable fit that enhances patient comfort and improves ease of use for staff. 4D-Core with odor protection wicks fluid away quickly to promote dryness and help maintain skin integrity. Soft anti-leak guards reduce leakage and improve containment. Active hip-protect side panels were designed to help protect skin from excess friction andpressure. Moisture alert wetness indicator changes color when garment has been soiled. Ultra-soft cloth-like backsheet. Skin-safe closures. Available in sizes MD/RG (32" - 54", 8-137 cm); LG/XLG (48" - 66", 121-167 cm); and XLG/XXL (60" - 70", 152-177 cm). Great products and super fast shipping. I will definitely use Allegro Medical again. Thank You!